Nicely moulded triangular rests with patterning to the end pieces and large clear centre sections. Estimated to be late nineteenth or early twentieth century and in excellent condition throughout. Totally clear moulded rests with shaped triangular ends and curved centre sections. They are in excellent condition for their age estimated to be very early twentieth century. Early cut glass rests in very good condition for their age. Well moulded with fine contours to the middle section and ends. Slight chip on one of the rests only and generally in good condition. Simple design moulded rests with minor imperfections but generally in good condition. Set of four rests with nicely cut centres and plain ends. No major blemishes and therefore in extremely good condition. Similar to no:0183 but much older, slightly longer and less opaque in colour. Very good condition with no major blemishes and estimated to be nineteenth century. Ball ends are multi-cut with a six sided middle section. Only slight wear to these attractive pair of rests. Perfect set of three clear cut rests with tapered ends. Extremely good condition cut glass rests with a dished shaped centre and raised ends. Moulded rests in art deco style in very good condition. Very attractive and decoratively cut and in very good condition for their age estimated to be late 19th to early 20th century. Cut glass to base only which gives an overall impression of total cut glass work. Very unusual and in good condition. 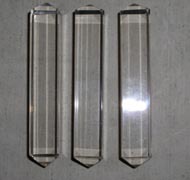 Set of four clear cut glass, elegant and simple design in perfect condition. Cut glass with intricate ends and triangular middle section, in good condition. Clear cut glass standard design but in very good condition. Quirky clear cut glass with etched middles and ends bearing the names on one section of the centre piece of "Fred" and "Nell". In very good condition. Attrictively cut ball ends with an eight sided middle section and in perfect condition. Finely cut middle section giving a cloudy impression. Flared cut ends are also shaped and beautifully presented. In extremely good condtion. Birmingham 1901, makers mark A.B. & Co.
Cut glass with silver banding to centre pieces. Very good condition. London 1896, Maker R. Peaston. 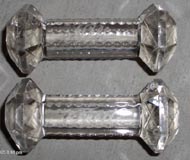 Beautifully cut glass with notched middle section with silver rings to each end. Birmingham 1899, maker Nathan and Hayes. Very ornately decorated cut glass with star cuts to the ends, all in excellent condition. In good condition for their age with no major imperfections, well cut and very attractive. Thin silver rings around end signify their age.